Industries across the world are making the switch to electric actuators. With increasing demands for lower power consumption and higher precision, planetary roller screw actuators are becoming the next generation of hydraulics and pneumatics. Roller screws offer a superior alternative in performance compared to hydraulics, pneumatics, and ball screws in areas such as heavy loads, high speeds, precision, heat, and noise. 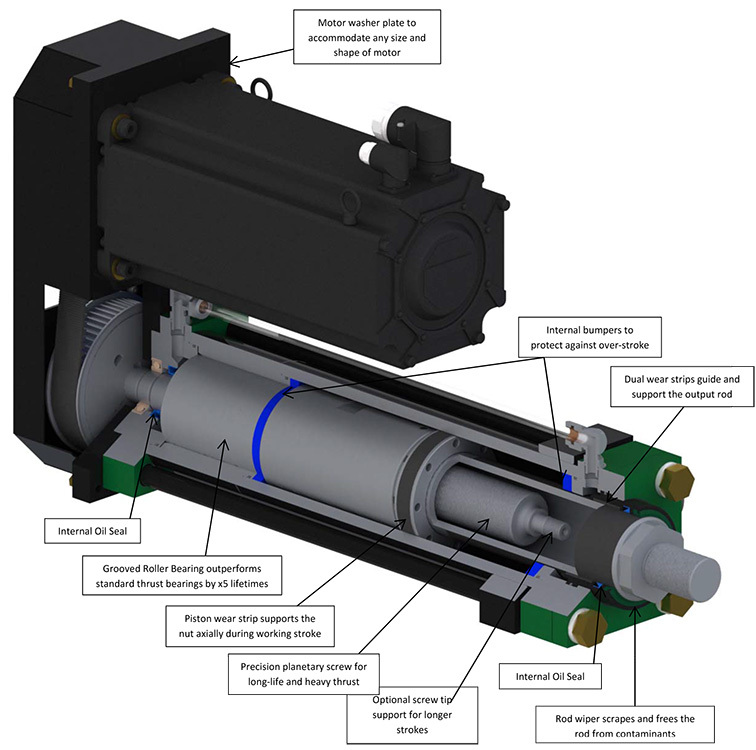 Royal Cylinders’ E-Series electric actuators utilize a planetary roller screw to convert rotational servo-driven motion into linear extension and retraction of an output rod as the screw rotates. 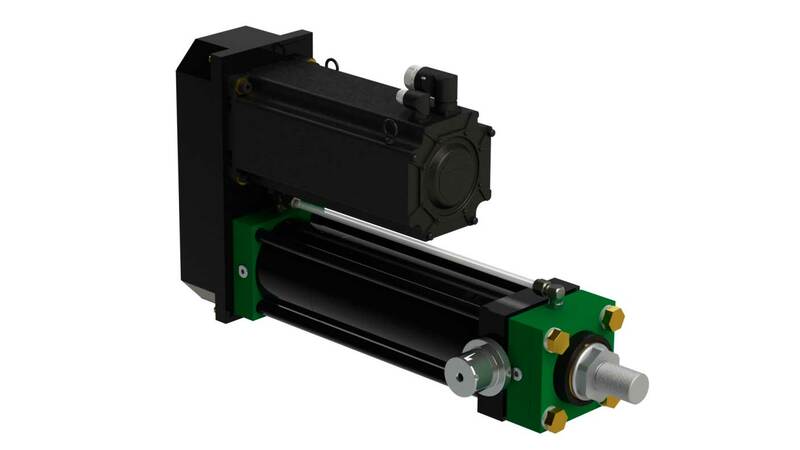 An externally mounted servo motor supplies the rotational force required to provide the linear action. Like all Royal products, the E-series cylinder was designed to be the toughest on the market. All-steel construction, coupled with a precision-made intelligent roller screw makes the Royal E-series actuator the most durable and advanced on the market. The electric series actuators are assembled in heavy wall steel housings able to withstand the harshest of environments. Standard models are able to push forces of up to 35,000 lbs. Chemically inert oil-flow tubing allows users to visually ensure that sufficient oil is present within the actuator during operation. The E-Series has various methods of maintaining a clean and contamination-free internal environment. The gland bushing provides a ridged external wiper to scrape and free the output rod of outside contaminants as it retracts into the cavity of the cylinder. Additionally, oil seals in the front and rear of the unit provide the roller screw an isolated and clean working environment, free of contaminants. The E-Series offers both induction hardened chrome plated (IHCP) and nitrided output rods which outperform standard chrome in surface hardness, corrosion and dent resistance, providing longer seal life. Units are available with the option of heavy-duty in-line direct motor mounting or parallel motor mounting, depending on the configuration and application of the end-user. The electric series provides a heavy-duty rugged solution in the smallest housing possible, while maintaining high-speed capabilities and a long working life. Planetary roller screws utilize threaded rollers which provide a much larger load distribution due to having many more contact points between the rollers and the threads of the screw. This allows for a higher load capacity and a longer life as compared to ball and acme screw actuators. All load-bearing surfaces are made from hardened steel and are precision ground to ensure maximum lifetime operation. When it comes to making the right selection for a new electric actuator we will work with you in getting the correct actuator to do the job. Our engineers are here to help with anything you need.